Through a partnership with the Centers for Disease Control and Prevention and Alabama Extension, ALProHealth ignited grassroots efforts to transform the culture of rural Alabama. 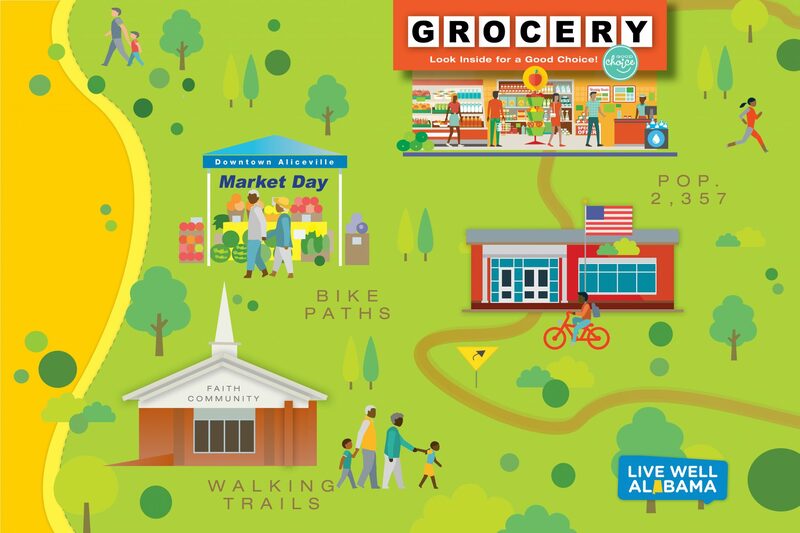 Alabama Preventing and Reducing Obesity: Helping to Engage Alabamians for Long-Term Health (ALProHealth) aims to prevent and reduce obesity by supporting community coalitions in creating healthier communities. The goal of CDC ALProHealth is to foster healthy lifestyles in 14 counties with adult obesity rates greater than 40%. A key aspect of community coalitions is the value-added of SNAP-Ed educators. The long-standing, respected county relationships these educators bring to the coalitions has propelled this initiative. The Aliceville Community Coalition is comprised of 12 leaders who represent the City of Aliceville, Pickens County Chamber of Commerce, Alabama Power, The Westervelt Company, Alabama Extension, banks, faith communities, and community champions. Coalition members used needs assessment results to develop and implement strategies to increase access and appeal of healthy foods and physical activity opportunities. It is becoming easier to be a healthy citizen in Aliceville!